This 1760 gothic style house located next to the Amedillo parish church has been designated a building of National Historic Interest. The house has recently been restored maintaining the original structure of the Baroque period as can be witnessed by the timber beams and the coat of arms on the front of the house. The decor is simple and elegant with mainly neutral colours that contrast with the slate flooring and stretches of stone on some of the walls. The sitting room, with a fireplace has a large window that opens out onto a small pleasant patio with a marble fountain surrounded with plants and flowers. The breakfasts are plentiful and include local delicacies such as home-made jams made with lemon, apple with rum and raisins, chestnuts and mandarins. The rooms are spacious and very comfortable and the only sound that can be heard is the chime of the church bells. Azofra - town in La Rioja - attractions include the David Mereno Winery, Rioja Alta Golf Club, San Millan de la Cogolla Monastery, Paternina Winery, Wurth Museum and Valdezcaray skiing. 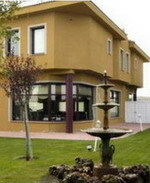 The Real Casona de las Amas is located in Azofra in Rioja, within five kilometres of David Mereno Winery and seven kilometres of Rioja Alta Golf Club. 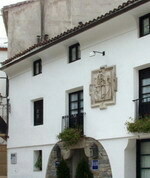 The hotel dates from the 17th century and has many original features such as coats of arms and fireplaces. There are spa services onsite, which include in-room massage and a jetted tub. Complimentary parking is available and there is an outdoor swimming pool. The restaurant at Real Casona de las Amas serves Mediterranean dishes in an informal setting. Breakfast is complimentary and there is a bar. Guests can hire bicycles from the hotel and play mini-golf in the grounds. There are 16 guestrooms at the hotel, all of which provide desks, wireless Internet access, and safes. Located 1 kilometre from the city centre of Calahorra, on the N-232 road, right in the heart of the La Rioja vine-growing area. It is a hotel with 30 rooms, ideal for enjoying a few days in the countryside, as well as for business people and representatives, to stop off and enjoy a complete range of services and comfort. 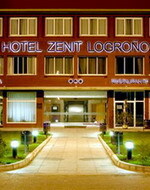 The hotel has a good restaurant, which is specialised in the traditional cuisine of this rich agricultural area, and it has its own car park (20,000 sq.m.). It also has a green area with outdoor swimming pool. La Plana Restaurant - Our restaurant service offers you the possibility of enjoying our buffet breakfast where you can taste the most appetising dishes. We set our offer off with the La Plana Restaurant, where you can taste exquisite dishes which will delight lovers of good food. Haro - Haro region is the most northwestern region of La Rioja, becoming the frontier with Burgos and Alava. Its capital, Haro has a 40.32 Km2 area. It is the economic centre of the administrative area, which embraces 49 town councils, including Haro. Its altitude above sea level (496,50m in the Paz Square) provides a warm climate in summer and a cold and cloudy weather in winter. Haro is the center of wine production, and a well-known folkloristic event is its annual "battle of the wine". 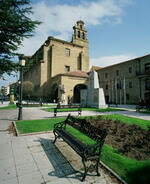 Of major touristic interest is the the Camino de Santiago (Way of Saint James), a part of which leads through La Rioja. The monasteries along that way are not only of high artistic but as well cultural importance, here was written the first text ever in Castilian Spanish. 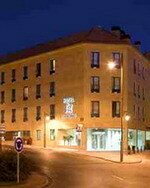 This modern and comfortable 3 stars hotel is located in the heart of Haro. 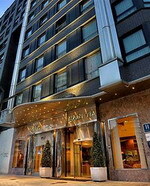 This charming hotel, inaugurated in April 2000, is modern in style yet maintains functionality and comfort in every setting. Every aspect of the decor, down to the finest detail, has been thoughtfully produced to create a pleasant and relaxing environment, so that you can enjoy comfort and a well-deserved break during your stay. Standard double room - standard room with 2 twin beds / full bath satellite TV / spacious / air-conditioning - standard room - standard room with 2 twin beds / full bath satellite TV / spacious / air-conditioning. 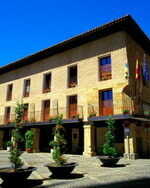 Laguardia - situated in the Rioja Alava wine region 20 kilometres from Logroño. Set in the Rioja wine region, the Hotel Marqués de Riscal is located in the centre of Elciego, Spain, within 22 kilometres of Logroño and 110 kilometres from Bilbao. The boutique Hotel Marqués de Riscal is housed in a landmark avant-garde property designed by Frank Gehry, with his trademark curved metal flourishes offsetting the hotel's historic 19th-century wine cellars. At the Caudalíe Vinothérapie Spa, guests can work out in the fitness room, cool off in the indoor pool, and relax in the sauna and steam room or with beauty treatments incorporating 'wine therapy'. The hotel also has a rooftop lounge and library, and guests can take in panoramic views of the town and vineyards from the hotel's eight terraces. 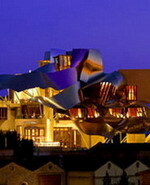 The Hotel Marqués de Riscal offers two dining options both featuring a contemporary design by Frank Gehry: the hotel's Michelin-starred main restaurant offers traditional Basque cuisine with a French influence; the trendy 1860 Restaurant offers panoramic views and serves regional and international dishes. 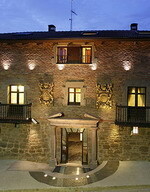 The Sercotel Hotel Villa de Laguardia is located in the medieval town of Laguardia, Spain, 12 kilometres from Logroño, in the Rioja Alava wine region. There are various golf courses in the vicinity, the nearest of which is at Logroño, 20 kilometres away. Organised wine tastings are also on offer. The Sercotel Hotel Villa de Laguardia is a modern hotel, with traditional-style wooden or tiled floors and natural coloured decor. It has an extensive wine cellar and a library, with visits to local wineries organised by staff. The garden has a waterfall and outdoor pool, and other facilities include a solarium, gym with sauna, and TV and reading rooms. There is a large recreation area for children. The Villa de Laguardia has a bar-café, and drinks can be enjoyed in the garden. 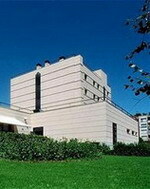 The El Medoc Alaves restaurant serves Basque cuisine complemented by an extensive wine list. The dining room, with its wooden floor, is decorated in pale blue and white. 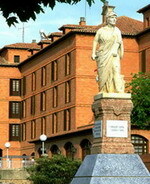 Logroño - Logroño is the capital of La Rioja, formerly known as the province of Logroño. 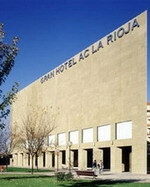 It is a centre for processing the Rioja wine for which the area is noted, and has also produced wood, metal, and textile products. 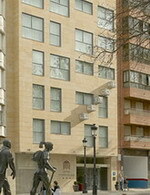 Also Logroño is one Spain's most commercial towns and has been granted several awards due to the high quality of its commerce. Most of the clothes shops, the shoe shops etc. 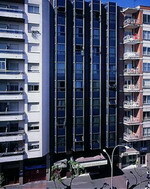 are located in the City Centre. The Parador is in a 12th century former hospital next to the Cathedral, built by Saint Domingo to house the pilgrims on St. James' way. Regal and elegant in style, it has majestic lounges and a vestibule full of gothic arches and coffered ceilings. Noble materials and bright colours – blue and white – lead on to comfortable, tastefully decorated rooms, some with canopied beds. These warm, harmonious surroundings are also suitable for social events and gatherings. The local red peppers must be sampled, especially if they are stuffed, whether with black pudding or other foods. The mixed vegetable platters are a famous product of this excellent farming region. And naturally, everything is accompanied by the exquisite wines of La Rioja.